At Easter, the Chocolate Shop window is always full of Easter Eggs, until one year the Chocolate Maker puts Easter Bunnies in the centre of the display instead. The Eggs are furious, thinking it’s their right to have pride of place, while the Bunnies claim it’s their turn. 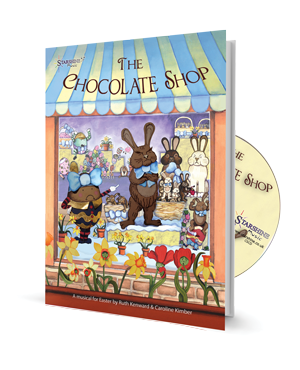 Although the Tulips and Daffodils try to keep the peace, the Bunnies and Eggs fight with each other and the Chocolate Maker is very disappointed in them. The Eggs and Bunnies are ashamed, and with the encouragement of the Tulips and Daffodils they all apologise. By the time the Chocolate Maker returns they’ve forgiven each other, and there is joyful celebration. The shop window will look beautiful after all! 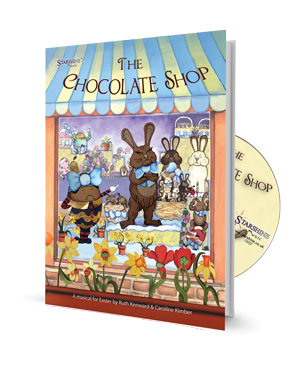 I have been using 'The Chocolate Shop' with a small group of Year 1 and 2 children as an after school club. We have really enjoyed learning the songs and doing a small amount of acting to accompany it. The children have loved the experience. Many thanks for producing 'The Chocolate Shop'. It has been a really fun experience for the children in my club. We performed this at the school assembly. The songs are really catchy. We all loved it. I simplified some of the text as the cast were very young (5 and 6 year olds). A lovely story and good lyrics. A well presented show and easy to work with. Your children will love it and so will all the grown ups. Effective music and flexible staging for specialists and non-specialists alike.